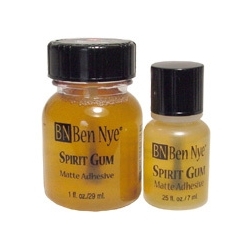 Ben Nye spirit gum adhesive dries to a flat finish and keeps beards, hair pieces, and prosthetic appliances attached firmly. Tap adhesive until "tacky" before use. Remove from skin, hair pieces and prosthetics with spirit gum remover. Available in .25 oz., 1 oz., 4 oz., and 8 oz. bottles.